Down in South America, coca means a very specific thing. You know, that thing that gave Coca-Cola its name. But up here in Pittsburgh, namely Lawrenceville, coca is for Coca Cafe which, as far as I know, has no connection to cocaine. Instead, it seems to be very connected to brunch. So, with little concern for accidental drug use, we braved the 45 minute wait and got ourselves in for a little Sunday brunch. While visiting my grandparents in Rancho Mirage, they took me to a great little breakfast place called Palms Cafe in Palm Desert. Knowing my grandparents would never lead me astray, I was pretty excited. We took a seat outside and perused the menu. 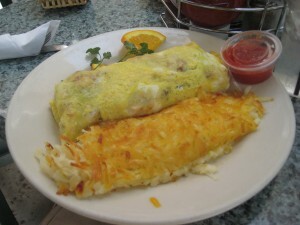 As most cafes go, they had a pretty good collection of food, but I sought out my favorite breakfast food, the omelet. Since I don’t think I had ever seen turkey offered in an omelet before, I ordered one with turkey and cheese. I also got some bacon on the side. 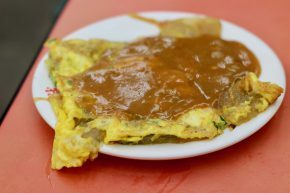 It came out pretty quickly and was one of the most interesting omelets I’ve ever seen.